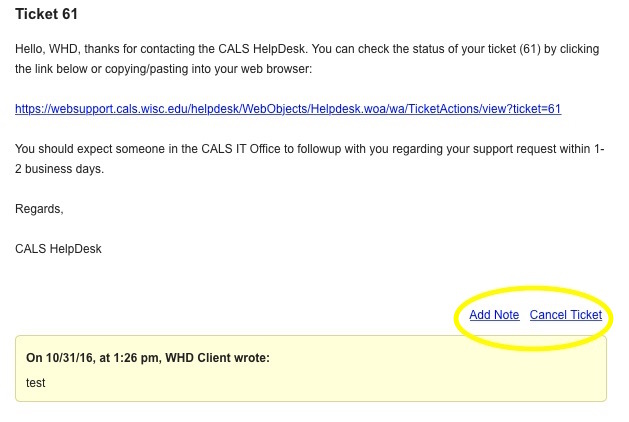 Once your ticket has been created in the CALS HelpDesk system, you can view & manage your ticket. Some functions for managing your ticket are available through email while others are available online using the HelpDesk web interface. Click on the History tab. Here you will see a listing of all your active submitted tickets with search capabilities at the top of the screen. A blue indicator will be listed next to tickets that have been updated by a technician. Estimated Due Date = The date the technician expects to have the ticket resolved. This date may change as ticket work progresses. Location = The client's location that was identified when the ticket was created. Room = The client's room that was identified when the ticket was created. Request Type = The assigned request type for this ticket. This was either selected by the client or updated by the technician. Subject = May be blank. This is typically captured from email submitted tickets. Request Detail = The information that was submitted at the time of the ticket creation. Tech = The technician who has been assigned to your ticket. Other fields = Depending upon the request type, additional information may be listed below the technician name. For tickets you "own" you will be able to edit the submitted ticket for items such as uploading file attachments, adding notes, adding/modifying ticket request details and canceling the ticket. Once you've made changes, click on the Save button to save any changes you've made to the ticket. On tickets that you don't own (i.e. you've submitted on behalf of another client), your view will be limited to read-only. To add a note to your ticket, click on the Add Note link. A new email message window will open. Replace the text in the body of the message with the note you want added to your existing ticket. For example, you would replace "REPLACE THIS TEXT WITH YOUR NOTE FOR TICKET 61. Do not include your signature." with "I forgot to mention that I was also having problems printing". If you are using a signature on your emails, remove it before hitting the Send button. 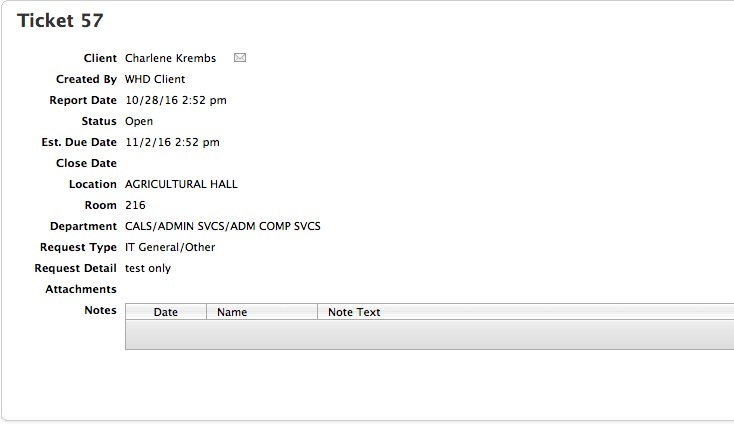 You will see this same information if you log into the CALS HelpDesk webclient and view your ticket under the History tab. To cancel your ticket from an email, click on the Cancel Ticket link. A new email message window will open. You do not need to add/change any of the text in the body of the message since the body of the email message will be ignored. Once CALS HelpDesk has received your message, your ticket will be canceled and a confirmation message will be returned to you.